Close your eyes. Notice the patterns and colors that appear behind closed eyelids. Hear your thoughts and notice if they have a tone, a color, a pattern. Then tune into your breath and observe all the hues that reside between an inhale and an exhale. Let this experience gently open your inner eye, and direct your gaze towards the myriad of layers that make up the universe within you. Nat Girsberger’s Close Your Eyes observes the layers of the inner world through mostly analog collages. Her body of work creates a visual meditation journey into the surreal, colorful depths of the psyche. She examines an unconscious freed from the structures of a too open-eyed ‘reality.’ In Girsberger's view, that reality has been constructed by a collective unconscious enslaved by an effort to organize itself in the world’s physical expression. Trauma and conditioning have been stacked like pieces in her work and are in desperate need of reassembling. Girsberger’s show softens our control on what we allow into our immediate perception, so that we can gently access our psyche’s ever-expanding potential to explore gravity in a new context, travel through time and enjoy it, too. Close Your Eyes aims to catch up the visual sense to a unified field ready to emerge into the physical realm, as to ultimately create a fuller experience of our truly surreal existence - while still being in and of the world. Nat Girsberger collaborates with her unconscious to explore the infinity of her psyche to break the structures that externally limit her inner vastness, by applying an instinctive ‘automatic’ work process. Through collaging, the subconscious mind finds new relationships by juxtaposing what does not usually go together. It challenges reality by encouraging the dialogue between ego and what is unknown to it. Take a deep breath and bring your awareness to any inner colors once more, notice if they have become more vivid. Gently open your eyes and let your internal and external colors mix. Now it is up to you to really see. Nat Girsberger is a Swiss visual artist based in Brooklyn, New York City. Girsberger holds a degree in visual communication from NYU and specializes in analog collaging, taking commissions in her Bedstuy studio. Girsberger also works as an installation artist and production designer, and is a committed student of meditation and yoga, which influences her art both visually and conceptually. Her work has been exhibited in various medias across the globe, including Whitehot, Kolaj and Art Reveal. New York City exhibitions include a pop-up solo show at Ivy Brown Gallery, hosted by New York Times published art writer Kurt McVey, and group shows at Carrie Able Gallery, Wallplay and Gallery Sensei. 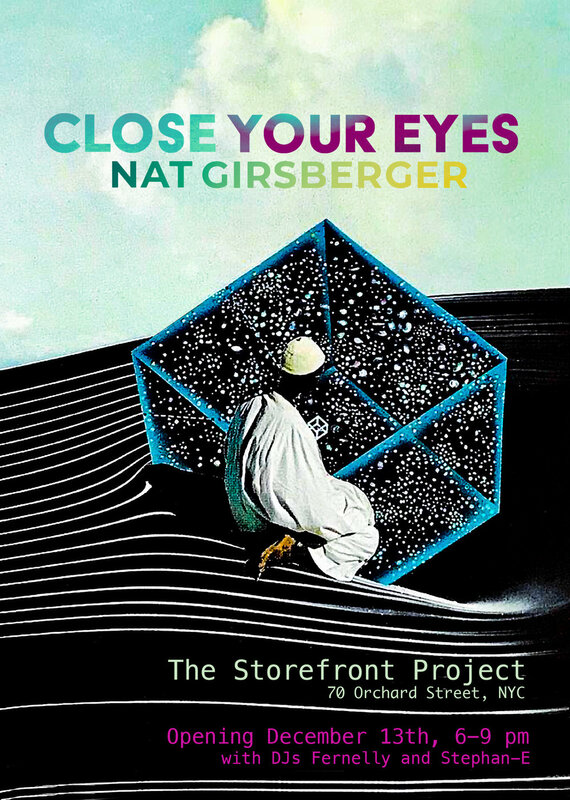 Nat Girsberger’s Close Your Eyes opens December 13th and runs through January 6th, 2019.